This topic contains 14 replies, has 3 voices, and was last updated by tonydavies 4 years, 3 months ago. Two Teams line up for a Charity Football Match on the Molineuex Grounds in 1926. The Question is of What?……..
Two of the names, Gill and Dickin, in the Retail Team seem familiar. I believe that they were meat purveyors. In fact, if I’m right, I used to drink with J Dickin’s grandson, Phil. You are correct Tony It was as you say a Charity Match at the Molineux Grounds between the Retail and Wholesale Butchers. There is also 3 quality Wolves players participating in the match can you rpick out their names. I am sure we can keep this going a little longer. Hello Billy, Merry Christmas to you and to all Lost Wolves members. The names Blakemore and Jewkes seem familiar. Bit before my time, though! A bit before all our times now I would think Maggie. But the some of the names certainly carried on to the 60’s and 70’s and some like Gill’s to the present day. Some that lived in the All Saints area might recal David Jewkes whose Butchers shop was in Steelhouse Lane . 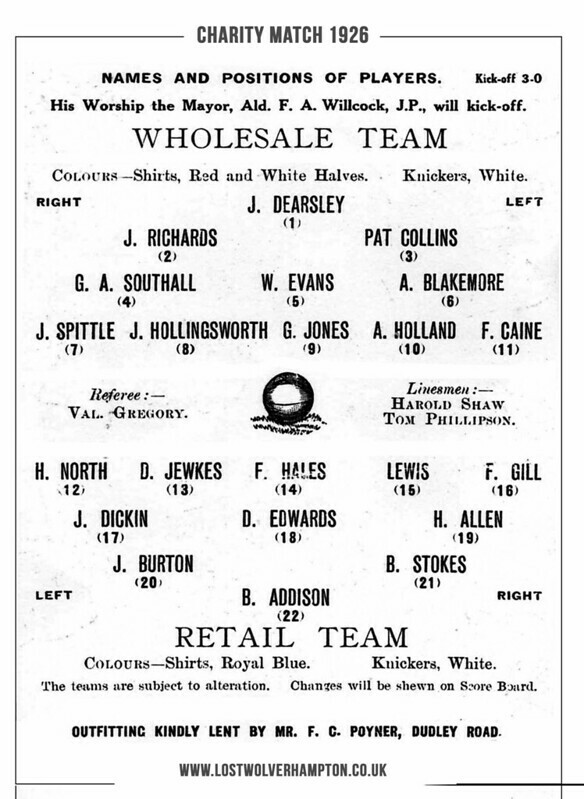 and of course The name of Blakemore the Wholesaler’s is still well known across the Midlands today. Thankyou Maggie for your comment. I still would like to see some interest in naming the Wolves connections . 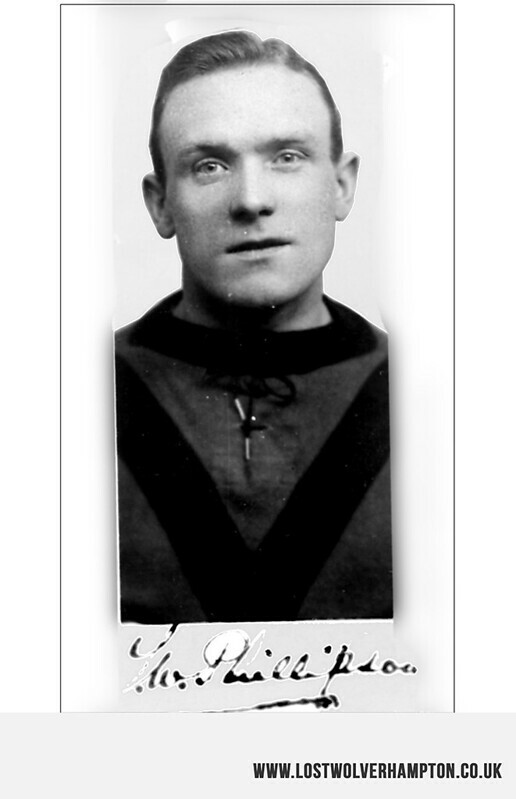 I think the Wolves players were Richards and Hollingsworth with Tom Phillipson taking on the roll of linesman, but there was also a Harold Shaw who played for the team around that era, so could he be one of the three? We are getting there Tony, although not quite right although the names Hollingsworth and Richards have both appeared on the Wolves programmes over the years. In this case I would say the are Butchers in the Wholesale meat trade. 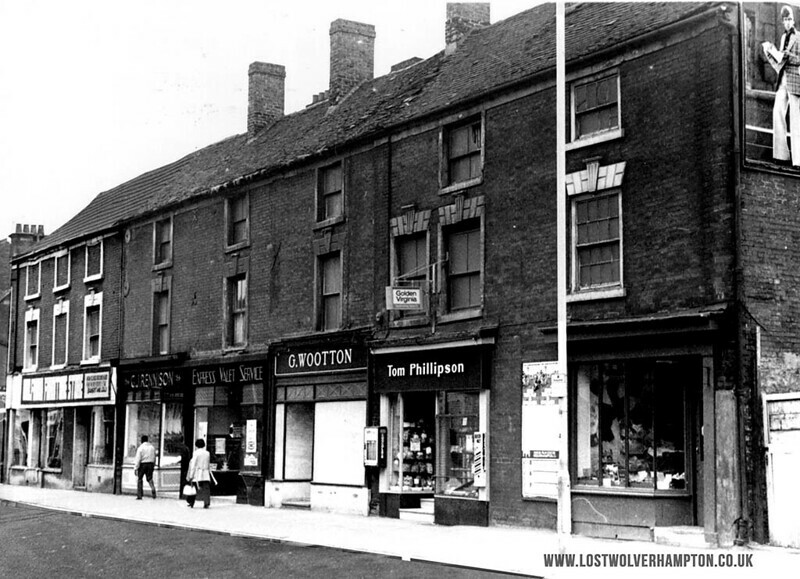 Hollingsworths were a big Pork Wholesalers with Works and shops both in Horseley fields and Lichfield Street. So the other fellow shouldn’t be hard to find now. My mistake Billy. 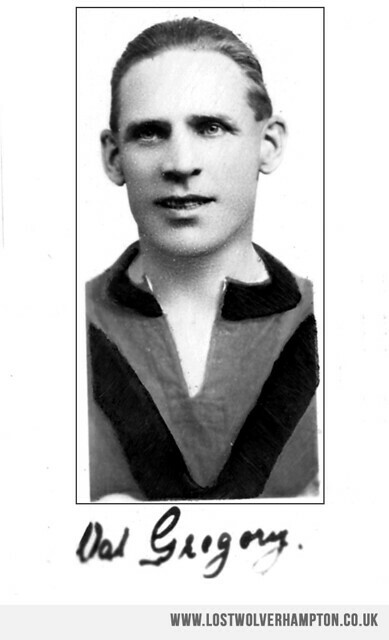 Reg Hollingsworth didn’t join Wolves until the 1927 season. I’m going for the final official, Val Gregory. Well done Tony – The other Wolves player and Referee for the match was Val gregory Wolves Captain in their 1921, losing Cup Final team . We mentioned Tom Phillipson earlier who after he retired from football, stayed in Wolverhampton and later became Mayor. He also went into the retail trade as a tobacconist, with shops in Victoria Street and one seen her in Horseley Fields. When this road was first cut to join up with Walsall Street at the start of Willenhall road what was its original name. When you asked this question, Billy, I thought I’d get my 1901 OS map of Wolverhampton (NE) and Heath Town out and have a quick scan. Guess what? That section is just off the page! Also checked Isaac Taylor’s map of 1750 but that was way too early. Unless I can find something on-line I have to admit to being stumped this time. I have one of the orignal prints of Isaac Taylors Map and it is shown on mine. Now you mention it Billy, I did see Coal Pitt Road but didn’t connect it with Horseley Fields! Sometimes I think I should believe the evidence of my eyes!! Still, it did give me an excuse to get the old maps out again – never a bad thing.